After 20 years of Vintage Racing the first thing I do when putting a race bike together is Race Tech Suspension, it just works! Off Road Motorcycling was better back in the day! The days of Legnads and Heros Until we ride those bikes again and realize just how poor their Suspension was and how weak the brakes were... From the 60s thru the 80s Suspension and Brakes that were not up to the demands of harsh terrain, jumps, moto-x tracks, engine power and rider performance demands. Race Tech has solutions for Forks, Shocks and Drum Brakes for most models. Race Tech upgrades can bring your vintage motorcycle suspension performance up to modern standards. RT Hi-Performance Springs are extremely lightweight and the first important step to a proper setup. Gold Valve Emulator Kits for Forks are designed to offer the damping characteristics of modern cartridge forks. They provide personalized setup with easy adjust ability that provide significantly better flow, a more consistent plush feel with increased bottoming resistance. G3-S Custom Series Shocks provide a custom setup as well as your choice of features and colors with guaranteed performance. Plus like all Race Tech products they are made in the USA! Brake Arch service optimizes Drum Brake Performance with greatly improved stopping power, feedback and firm feel at the brake lever. Don't overlook this surprising service! The first step to great handling is selecting proper spring rates. With over 500 Hi-Performance Springs to choose from, Race Tech is almost guaranteed to have the spring you need. Through years of testing and manufacturing experience, Race Tech has developed a full line of Hi-Performance Springs using the finest materials and processes. RT Springs have the highest stiffness-to-mass ratio in the industry; making them extremely light weight for their particular rate. Our Fork Springs for Vintage Models are built to the same standards using the same materials as Modern Bike Springs! 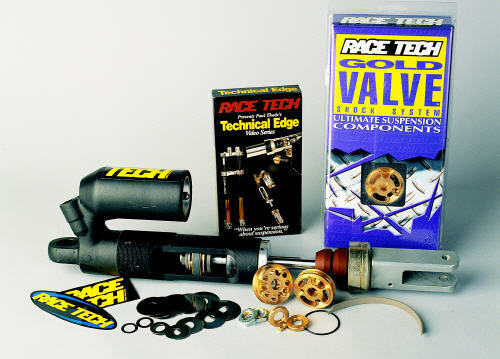 Race Tech's award winning Gold Valve Emulator Kits for Forks provide a personalized setup and adjust ability. Gold Valves Emulators improve fork oil flow dramatically reducing harshness while actually increasing bottoming resistance (as shown with data acquisition). These Kits can often be installed by individuals interested in understanding and tuning their own suspension or they can be installed by a local Race Tech Center, Dealer or of course the Race Tech's Service Department. Gold Valve Kits include Installation Instructions, Tuning Guides and alternate parts to allow a custom setup and adjust ability for rider preference and type of riding. Most 70's & 80's OEM Vintage Mono Shocks are Rebuildable. Many of the late 70s thru 80s shocks had poor quality valving systems. We have figured out a way to fit the latest technology Gold Valves on most vintage shocks. You will be amazed - guaranteed! Another benefit of this process is the shock receives a full service rebuild, too often overlooked and critcal to proper perfromanceand shock like even with stock settings. Race Tech will service most OEM and aftermarket shocks. Regardless of brand, we have most rebuild parts in stock as well as spring upgrage options. Hard Anodizing is also available and desperately needed process for vintage shocks. Race Tech's G3-S Custom Series Twin Shocks for Vintage Motorcycles are custom built to order with your choice of features. length and colors. These shocks have been praised by both recreational riders and AHRMA Racers alike in all types of conditions all over the world. Engineered to be ultra-durable and tested on the track to shave seconds off your lap times or provide comfort and confidence on the street; these shocks are state-of-the-art. ►G3-S Vintage Race Shocks in Action! TNK manufacturers OEM quality replacement fork tubes for Street, Road Race, Sport, Sport Touring, Touring and Vintage motorcycles. They are made from the highest quality materials and generally significantly less expensive than original equipment. Don't overlook replacing bent tubes or tubes with worn chrome, pitting, or rust. Race Tech has most TNK tubes in stock, ready to ship! Fork Sliders on Vintage and Classic Models are not hard coated. In fact most do not even have bushings. The results are high friction, high wear and rapid oil contamination from aluminum shed due to the chrome fork tube working directly against the naked aluminium slider. Hard Anodizing is strongly recommended for Vintage & Classic Forks! Hard Anodizing is a coating used on modern forks that can be applied to most fork sliders to reduce friction and wear. The outward appearance is a matte black look similar to black late model fork. This process is also available for shock bodies provided the shock is rebuildable type. Powder Coating of Fork Sliders is also available for top grade cosmetic appearance. Get the best of both performance and appearance by having your fork sliders both hard anodized and powder coated! Brakes are one of the weak links of Vintage Motorcycles. Weak stopping power and spongy lever feel are common complaints of vintage drum brakes. This can be remedied with Race Tech Brake Arcing Service. With the popularity of drum brakes on vintage motorcycle builds as well as vintage race rules requiring the use of drum brakes this service is a big advantage. For the racer lap times improve, for the street rider safety improves. After all, whether you are facing turn one a little too hot or you are facing a left turning SUV, stopping power becomes everything! Add improved braking to your Race Tech Suspension to complete your vintage motorcycle upgrade! See what customers are saying about Brake Arcing! G3-S equipped 1975 Honda XL125K1 on the fly in AHRMA Vintage Round 9 at Sky High MX Park in Old Appleton, MO. Thank you Race Tech! Short travel suspension models are very compromised and need the most help. Fork Spring upgrades are a must and Gold Valve Emulators take the harshness out of the forks while offering adjustability the rider can tune quickly and easily to suit their riding type and preferred feel. Vintage models sported drum brakes that lack the stopping power these bikes need, send in your drum brakes for Brake Arc Service for dramatic improvements in stopping power! Race Tech vintage guy Matt Wiley can be found track side offering Rider Support at selected AHRMA MX & Road Race events. "I have been racing 40 years and I relay on Race Tech for my Vintage Suspension! Competing on modern tracks with these bikes demands suspension improvements to be competitive. Thank you Matt & Race Tech!" Late 70s models thru the 80s had good sized 38mm & 43mm forks with decent shocks offering long travel. What they lacked was proper settings. Replacing the overly soft fork springs and eliminating the need to run air by installing Race Tech Springs. Gold Valve Emulators smooth out harshness and offer easy adjustability to suit rider preference. Shocks on this generation of MX are fully rebuildable responding exceptionally well to Race Tech Spring and Gold Valves. These bikes can run with late model bikes when fully Race Tech equipped front and rear! Post Vintage/Evolution models often sported drum brakes that lack the stopping power these bikes need, send in your drum brakes for Brake Arc Service for dramatic improvements in stopping power! Race Tech Sponsors AHRMA Post Vintage MX Series. Our vintage guy Matt Wiley can be found track side offering Rider Support at selected AHRMA MX & Road Race events. Race Tech Hodakas Medal at the 2012 ISDT! Race Tech has a Fork Upgrade and G3-S Shock solutions for any build, any budget. Brake Arcing is available for drum brakes and strongly recommended. No matter if you race thru the woods of Ohio or the desert of Baja you want good suspension! At Race Tech we can setup any kind of suspension customized for your riding style! Don't overlook the drum brakes lacking the stopping power these bikes need, send in your drum brakes for Brake Arcing Service for dramatic improvements in stopping power! XR200 models have weak drum brakes that lack the stopping power, send in your drum brakes for Brake Arcing Service for dramatic improvements in stopping power! 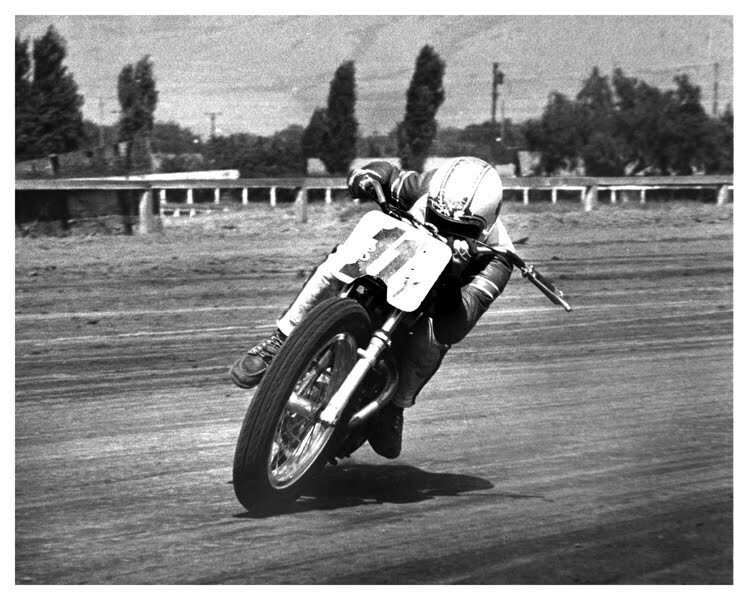 Flat Track Racers start with BSA Gold Star, Bultaco Astro, Harley Sportster or XR, Honda XL/XR500, Yamaha TT500 or XS650, Triumph or whatever your platform may be. If you are using the original forks or late model forks Race Tech has Fork Spring and Gold Valve options for you! Fork setup is custom based on your build, G3-S Custom Shocks are built to your bike's specs with your choice of features and colors. Make sure your Tracker handles as good as it looks! Vintage models sported drum brakes that lack the stopping power these bikes need, send in your drum brakes for Brake Arcing Service for dramatic improvements in stopping power! These models with drum brakes that lack the stopping power they need, send in your drum brakes for Brake Arc Service for dramatic improvements in stopping power! 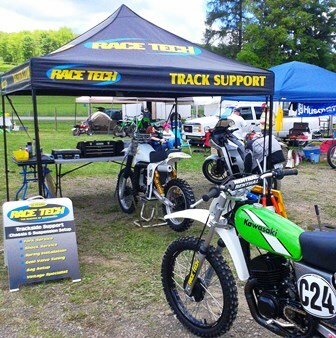 Race Tech vintage guy Matt Wiley can be found trackside offering Rider Support at selected AHRMA MX & Road Race events. Special Builds are Perhaps the Ultimate, Creating the Motorcycle You always Dreamed of! Improve Yours with Race Tech! Models with drum brakes that lack the stopping power they need, send in your drum brakes for Brake Arc Service for dramatic improvements in stopping power! Early Husky forks, 35 and 40mm have a common problem with the piston bands. The stock Piston Bands are usually worn out and are known to break. Since these parts are now obsolete from the factory we have produced a hi-performance replacement bands for both the 35 (FPPR HQ35) and 40mm (FPPR HQ40) forks. We also have special Emulator Adapters for both of these forks NOW available. The performance difference with Emulators is huge! ►More info about how these forks work! *Note - On 35mm fork caps we have special copper washers (HMWC 3035) that seal perfectly. The stock 35mm forks don't have anything to seal them (plumbers tape doesn't work well on straight threads). This is a really clean solution. Early Maico 36mm Forks require a unique Gold Valve Design. The stock Piston assembly is replaced by the Gold Valve resulting in greatly improved damping and adjustability. 'Melt Down' to Race Tech Ready! Here's an interesting video from our associate Jaime Robinson at Moto Geo.com showing us his journey from the "Catalina GP" melt down he had, to rebuilding his YZ400 back to "Race Ready" condition for the CALVMX.com races held at the World Famous Glen Helen Raceway. Check out the link to learn about Motocross History in the USA! Legends and Heroes is a rolling Moto-Cross Museum outlining the history of MX in the US. Featuring displays of Championship winning Motorcycles, Riders, and Memorabilia along with multimedia presentations of classic races and interviews this display is not to me missed! The tour can be found at AMA Super-Cross, Outdoor and AHRMA National Events. Race Tech Supports Vintage Racing! Race Tech is proud to Support Vintage Racing offering on site Rider Support at selected Vintage Races. Pacific Northwest Vintage Moto-Cross PNWVMX is now Sponsored by Race Tech! We will continue to develop vintage applications and products as well as sponsor Vintage Racing. Race Tech also proudly supports the VJMC, WVM, AMA as well as other vintage Motorcycle Organizations. If your bike is not listed in our Product Search, you have questions about applications or setup please Email Matthew Wiley for Vintage Tech Support/R&D. Thank you AHRMA Trustees for all your help, Racers for your interest, and support! Race Tech Vintage Guy Matt Wiley can be found track side offering Rider Support at selected Vintage Race events. Matt Wiley aka 'Vintage Guy' will be at the 2018 Barber Vintage Festival for Rider Support. Email Matthew Wiley to schedule Barber Track Service. AHRMA Racers are encouraged to contact Matthew with needs for Barber ahead of time. This project has us very excited. We now offer 2 different G3-S Shocks for this bike; Piggyback Reservoir and IFP (non-reservoir). Of course we have Emulators for the front as well. We can also install a Gold Valve Conversion on the most OEM shocks. ►Check it out We have replacement reservoir hose solutions too. Give us a call. Thanks to Dean Pollak we have a really good setup with Gold Valves on a 1975 MX250B! Thank you Dean for choosing Race Tech! Need VIntage Info or Tech Support? Please contact Matthew at 951.279.6655 x108 Email Matt Wiley for Vintage Tech Support/R&D. Email Matt Wiley for Vintage Tech Support/R&D. Purchase our Gold Valve Kits, High Performance Springs, and Ultra Slick Suspension Fluids and install them yourself. (If you get stuck call your Tech Support 951.279.6655.) Hey, if you're really into it, check out our Suspension Seminars. Race Tech is track side at many AHRMA events to install or fine tune suspension for all riders! Need VIntage Info or Tech Support? Please contact Matthew at 909.273.4985 or Email Matt Wiley for Vintage Tech Support/R&D.